Hey everyone. D. Fischer here with my guest post. I'd like to take just a moment and thank Our Author Gang for hosting this. I'm just going to jump right into it. I'm an author of multi-genre's but have been focusing on Epic Fantasy recently. I grew up in eastern Iowa, and moved to western Iowa when I met my husband. We have two kids, a toddler and a first grader (if you ask him, the grade counts more than the age). We're a pet-loving family, with two dogs who are obsessed with socks, and a fat cat who adores me (I'm a dog person, so you can imagine my dismay). Growing up, I always wanted to write something. Anything really, I didn't care what. I loved using my imagination. I'd start a book, begin an outline, and a few chapters in, I would stop. Eventually, writing a book entered my "bucket-list." Last year, my husband was away on business and only home on the weekends. I grew bored with all that time to myself after my kids would be tucked in, fast asleep. Characters started forming in my head, plots started mixing, and worlds would be built upon those platforms. Last January, we didn't have a computer. We had a tablet. It was difficult, but I wasn't going to let that hold me back from bringing my imagination to screen. I started clicking away. In April of last year, I published my first book, A Gifted Curse (The Cloven Pack Series). Since then, I have 8 published books, and 9 published co-written books. As I mentioned before, my most recent works is Epic Fantasy. I fell in love with that genre, without actually meaning to. I've never read Game of Thrones (besides the first chapter), or Lord of the Rings. In fact, I had no idea that's what this book's genre was until after it was written. A dear friend was kind enough to tell me. This new series is called Rise of the Realms. There is 5 lead characters, some of them supernatural, and some of them human (for now ;) ). None of these characters know each other, but their fates and circumstances keep crossing. There's tie in after tie in, until everything comes together at the end of the first book. Well... not everything. Many subplots will be delivered in the second book - which I'm currently working on. Did I mention there is a dragon? Ghosts? Vampires? Shifters? Angels? This series basically has it all. What you don't see in the first book, you'll see in the second. Several new supernatural species are entering into the fold. 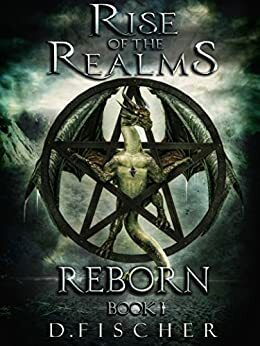 Reborn, the first book in the series, was difficult for me to write. I've never written a book this complicated, and I don't like to outline (I never follow it anyway). Besides finding the crossing fates of difficulty, there was a few times I grew too involved with this book. For example, to write a certain section for Eliza, I forced myself to listen to a song for several hours. The same song. Over and over again. I went a little nuts afterwards - I call it the 'writers doom and gloom'. I totally understand why writers from the past enjoyed that alcohol so much. Thankfully, I had wonderful author friends who pulled me out of that dark place my brain submerged me, and a supportive husband who understood. I'm proud of this book. It's my baby. I hope you find the time to sit down and read it, and I'm excited to hear what you think.